offered residents free breakfast in front of the building from a Wafles & Dinges Food Truck. 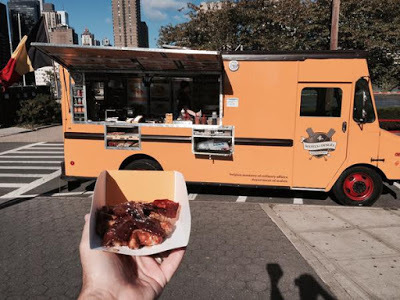 Unfortunately, the Wafles & Dinges Food Truck serving free breakfast to the Octagon residents got shut down by the Roosevelt Island Public Safety Department for not having a food truck permit. This morning the Octagon sponsored a Waffles & Dinges food truck event giving residents a free breakfast from 8:00am - 10:00am in front of the building. Nice Right ? Management trying to talk the officer down off the ledge... then it appeared as though the matter would resolve and they began continuing to serve - as I got to my next in line, it was determined the copy of the permit shown to the officer was dated 2015. He then insisted the truck be closed up and pull out......sorry folks. THIS is what Public Safety is concerning themselves with?? 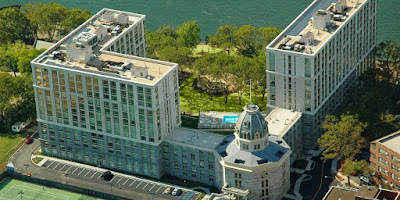 A catered event held on private property... drinking and pot smoking around children and graffiti on the waterfront are less of a concern than a waffle truck in front of the Octagon ??? !!! It was almost 9:30 when it was shut down and the event was scheduled to close at 10:00am anyway. This was truly a Barney Fife moment here in Mayberry. What happened to the days when the cops would have rolled up gotten a free waffle and moved on to more important threats to the community? Where is the common sense of looking the other way as there were no significant traffic obstructions, health or safety violations - simply some people getting a free treat in front of a building they live in and a pay a premium to reside. This was beyond the pale of common sense, decency and good community relations. I thought someone with a voice should be made aware of this demonstration of utter ridiculousness. ... it was just a bunch of people cued up along side the waffle truck. No brawl or anything just a bunch of dumbfounded people pissed off for waiting a half hour or so and not getting their free breakfast. I asked Roosevelt Island Public Safety Department Director McManus about the Octagon Wafles & Dinges Food Truck Incident. After looking into the matter, PSD Director McManus said that a Food Truck permit was required for the Octagon Wafles & Dinges free breakfast even if it was a private event on private property. Director McManus reported that after the Food Truck incident, he and Acting RIOC President Susan Rosenthal went to meet with the new Octagon building management and spoke about improving communications between the building management and RIOC. According to Dirctor McManus, the meeting went very well with Octagon Management and in the future there will be better communications between them. Octagon Management acknowledged they should have told RIOC about the Food Truck before it arrived.